. : Optics & Photonics Focus :: Tiny Mirrors in the Sky to Fight Global Warming :. Colors of a sunset. Aerosols in the atmosphere scatter light, creating impressive colorful sceneries. Photo: Alessandra Farinelli / e26.it. Spring 1991, Philippines: Mount Pinatubo, the volcano that had remained inactive for a good 450 years erupts and emits billions of tons of sulfur oxide (SO2) and dust into the atmosphere. As a result, the amount of sunlight reaching our planet's surface is reduced and there is a drop in temperature, of around 0.5˚C (0.9˚F)  — globally! This vividly illustrates that tiny particles in the atmosphere can affect the temperature both locally and globally. Following this idea, David Keith from the University of Calgary, Alberta, Canada, has recently proposed the suspension of tiny custom-made particles in the atmosphere to counteract global warming. Put simply, the Earth’s temperature is determined by its insolation and radiative heat loss. On the one hand, solar irradiation warms the Earth’s surface. On the other hand, the Earth cools down by radiating heat into space. This is why overcast nights tend to be warmer than clearer ones. Historically, warmer periods have, all along, and quite naturally, alternated with colder periods. However, a wealth of scientific research shows that human activity is significantly affecting the delicate atmospheric chemistry and that these changes increasingly translate to higher average temperatures. Greenhouse gases, such as carbon dioxide (CO2), absorb and re-radiate heat radiation while being transparent to other (visible and UV) radiation, thus acting in close analogy to a greenhouse used to grow plants. In addition, the industrial use of certain chemicals like the refrigerant chlorofluorocarbon (CFC) has led to the depletion of the Earth’s ozone layer, the very layer necessary to significantly reduce the amount of UV radiation that reaches our planet’s surface. The ozone hole in the atmosphere, as a result, has meant larger amounts of UV irradiation on the ground. Higher temperatures can have very drastic consequences on the environment. The melting of the polar ice caps results in a rise in the sea level and a higher probability of flooding in coastal areas. Warmer oceans mean higher probability and intensity of extreme weather phenomena like storms and hurricanes. The permafrost thawing engenders rock fall and debris flow in the mountains. And, of course, there are effects on the biosphere, ultimately affecting the long-term survival of our species. In view of all these problems, worldwide efforts are currently being undertaken to limit the effects of global warming. The volcano that changed the climate. 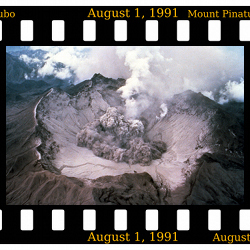 The eruption of Mount Pinatubo in 1991 led to a temporary drop in global temperature. This illustrated that tiny particles ejected into the atmosphere have the potential of changing the Earth's climate. This aerial view to the south of the Pinatubo crater shows the start of a small explosion on August 1, 1991. Photo: T. J. Casadevall / USGS. The standard approach to climate change caused by man is to attempt to minimize detrimental human impact on the environment. Typically, this is done by limiting carbon emissions into the atmosphere and by using the resources available in the most sustainable manner, as per the Kyoto Protocol of 1997. "We must eventually bring emissions of carbon to near zero," says David Keith, "in order to avoid dangerous climate change. Geoengineering technologies may—or may not—reduce climate risks, but they cannot avoid the necessity to cut emissions. Unfortunately, however, both the evolution of sustainable technologies as well as their implementation, seem to suggest that we might not be able to contain the effects of global warming within certain boundaries in the future. Therefore, there may well come a time when we need to cool the world's climate as an emergency measure, in order to avoid otherwise catastrophic effects. And this is where Mount Pinatubo and geoengineering come into play." Geoengineering  is defined as the idea to deliberately manipulate the Earth's climate in order to control, combat, or counteract the effects of global warming from greenhouse gas emissions. The key idea of geoengineering is to inject microscopic particles – such as sulfur molecules — in the atmosphere and use them to control the Earth’s climate. Depending on the type of particles or molecules, the Earth’s temperature can be affected very differently. In fact, particles in the Stratosphere (approx. 10-50 km altitude) and Mesosphere (approx. 50-85 km altitude) are most crucial for our global climate. "Though aerosols represent only a tiny 10-9 fraction of the atmospheric mass," says Thomas Leisner  from the Karlsruhe Institute of Technology, Germany, "they play a decisive role in the formation of clouds and precipitation and in the radiative balance of the Earth. Without dust (aerosols) there would be neither fog nor rain . We therefore have to care about both deliberate and unintended human interference with the aerosol system." The most common approach to geoengineering is to study sulfur compounds and their impact on the climate when — hypothetically — deployed into the Stratosphere. However, "the problem with sulfur," explains Keith, "is that it is very reactive and relatively short-lived, while long term effects of sulfur injection are extremely difficult to estimate." Keith proposes the use of tailor-made nanoparticles, acting as tiny mirrors reflecting sunlight in the Stratosphere or Mesosphere, as an interesting alternative to sulfur compounds. Such nanoparticles would be inert compared to sulfur and would not release large amounts of hard-to-control chemicals into the Stratosphere. Furthermore, it would be possible to engineer tiny mirrors able to levitate for extended lengths of time, thanks to photophoretic forces. And finally, such particles could remain close to the polar caps for longer periods of time thanks to their magnetic properties. Photophoretic forces acting on the tiny mirrors would counteract gravity, and this would increase dramatically the effective lifetime of these nanoparticles in the atmosphere. In essence, photophoretic forces originate from the fact that illumination of one side of a particle can lead to a net force acting on the particle. More precisely, explains Leisner, "a particle that is illuminated by sunlight from above, and which has different thermal properties on its upper and lower side, may experience an upward force due to the recoil from air molecules that absorbe and desorbe at different velocities from either side. As detailed in Keith's article, however, it is important to realize that there are two rather distinct mechanisms: either the particle assumes different upper and lower side temperatures, or — as necessary for the small particles considered here — it is engineered to have a different efficiency of transferring heat to the motion of the air molecules on either side of the nanoparticle." As a result, the particle can experience a force counter-acting gravity, causing the particle to levitate for long periods of time. "Magnetic properties of custom-made nanoparticles," adds Keith, "would enable us to ensure a higher concentration of these particles around the poles, where the ozone hole is most pronounced." In this way, the nanoparticles could even serve as a means to reduce insolation, specifically in those regions most affected by changes in atmospheric chemistry. Mount Pinatubo and geoengineering indicate that it may be possible to solve the global warming side of climate change — but at what cost? Keith and Leisner both suggest that geoengineering was treated as a ‘taboo topic’ for a long time; on the one hand because its consequences are so hard to predict, and on the other because it seemed politically dangerous to suggest that global warming could actually be tackled. "It is only after a widely disputed editorial article  by Paul Crutzen, who was awarded with the Nobel Price for his explanation of the ozone hole, that the topic has surfaced," Leisner points out, "even though it has been in the literature for decades ." "It is important to understand," Keith insists, "that there are a lot of open questions, potential dangers and even political implications associated with the idea of geoengineering. Also, this approach would only take care of the temperature and not, for example, of the shortage of resources, or of the detrimental consequences of pollution. In the end, we may well be forced to conclude that it's just not worth it. Nonetheless, we have here a method that might well work at a time where the only thing that counts is to bring the temperature down quickly — as an emergency measure, for example. And then, I prefer knowing what we are doing." B. J. Soden, R. T. Wetherald, G. L. Stenchikov & A. Robock, Global cooling after the eruption of Mount Pinatubo: A test of climate feedback by water vapor, Science 296, 727-730 (1992). Policy Implications of Greenhouse Warming: Mitigation, Adaptation, and the Science Base (Committee on Science, Engineering, and Public Policy, 1992). J. Feichter & T. Leisner, Climate engineering: A critical review of approaches to modify the global energy balance, Eur. Phys. J.: Special Top. 176, 81-92 (2009). John Aitken, On dust, fogs, and clouds, Trans. Roy. Soc. Edinb. 30, 337-368 (1880). P. Crutzen & J., Albedo, Enhancement by Stratospheric Sulfur Injections: A Contribution to Resolve a Policy Dilemma? Climatic Change 77, 211-220 (2006). M. I. Budyko, Climatic Changes (American Geophysical Society, Washington DC, 1977). David W. Keith, Photophoretic levitation of engineered aerosols for geoengineering, PNAS (2010) 107, 16428-16431 (link).